The Attorney-General and Minister of Legal Affairs, Sen. Kathy Lynn Simmons, congratulated the Mirrors Programme for continuing their 12 year tradition of exposing young people to the benefits of giving back to our community. 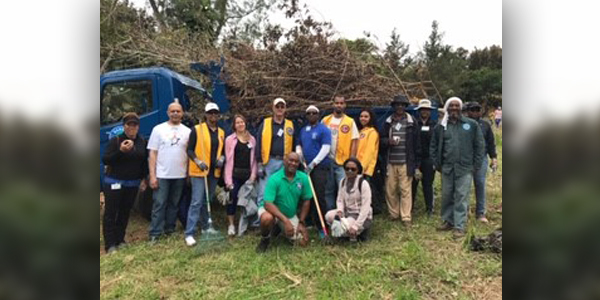 Members of the Hamilton Lions Clubs of Bermuda and 33 students, volunteer life coaches, community volunteers participated in a community clean-up at Southlands Estate. The purpose of the day was to clear natural debris, trash and abandoned furniture from the park, as well as pass on knowledge about the history of the park and the endemic and invasive plants and trees. Kim Jackson, Mirrors Programme Manager said, “Our service day is a wonderful opportunity for us to spend time with members of the community who are united with us to support Bermuda’s young people and preserve Bermuda’s architectural and ecological heritage. Minister of Legal Affairs, Senator Kathy Lightbourne congratulated the students for taking time to give back to their community. Minister Lightbourne said, “Since 2007, Mirrors students have engaged in completing a service project. I am pleased that this year Mirrors chose to partner with the Department of Parks to clean Southlands for the enjoyment of our fellow Bermudians and visitors. For more information about volunteering or enrolling your child into the programme please contact Mirrors’ Office Manager, Nicola Paugh at nmpaugh@gov.bm or call the Mirrors office on 294-9291. To find out more about Mirrors Programme and what it has to offer, please visit the programme website on www.mirrors.bm.